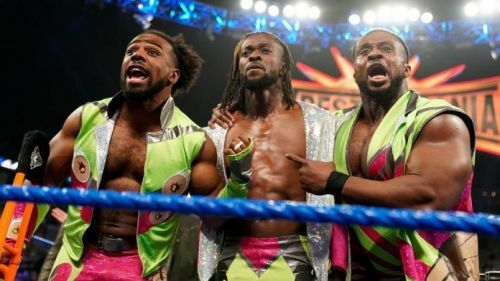 Opinion: Kofi Kingston to be cheated of his opportunity once again? Kofi Kingston has been on a roll ever since he made his way into the WWE title picture. While he has been extremely over with the crowd owing to his current build on the roster and the storyline he's involved in, the WWE Universe is excited to see how things turn out for Kofi Kingston at Wrestlemania. Kofi Kingston is currently in a storyline where he is being repeatedly swindled out of his championship opportunities. He is being displayed as a babyface who has been delivering exceptional performance since he debuted 11 years back but he still hasn't received an opportunity that is befitting of a hard worker like himself. He is further being pushed back by Vince McMahon who doesn't believe that he is 'Championship Material'. However, on the last episode of SmackDown Live, Vince McMahon said that he must defeat Randy Orton, Samoa Joe, Sheamus, Cesaro and Rowan in a Gauntlet match and he is 'going to Wrestlemania'. Although this came as a ray of hope for the fans, the truth is, Vince McMahon is just playing the vindictive boss that he always plays so well. If we were to think about it, Vince said that Kofi is 'going to Wrestlemania'. He did not say that Kofi would be facing Daniel Bryan for the WWE Championship. This is just a reliving of the Fastlane segment where Vince McMahon cheated Kofi Kingston. Vince however, put Kofi in a handicap match against the Bar where both the competitors would be in the ring at the same time. Vince said in the following episode of SmackDown Live that he did not say that Kofi was going to be in the triple threat match for the WWE Championship and he only said Kofi's match was next. This gives us somewhat of an idea of what is about to happen. The truth is, Kofi might not be able to clear the Gauntlet match which is because the odds are stacked against him. Not only are the five men the most dominant in the roster, but there also remains the fact that Xavier Woods and Big E are banned from the ringside while there are no such stipulations for the other competitors or the ones that would be accompanying them to the ring. Although, even if we take a distant shot and think that Kofi might clear the gauntlet match which is not very likely, Vince McMahon might come out and say that he never promised Kofi that he would be going to Wrestlemania for a championship opportunity. Vince might even go to the extent of handing him front row tickets for the event humiliating him further. WrestleMania 35: What if Kofi Kingston wins the WWE title at the PPV?